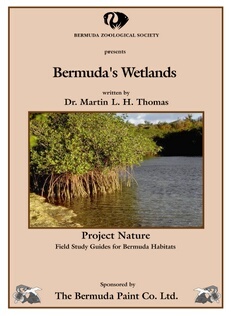 Spittal Pond is the largest natural area in Bermuda and covers 60 acres, including the coastal upland habitat. Bermuda’s three endemic trees, Bermuda Palmetto, Bermuda Olivewood and Bermuda Cedar are easy to view at the start of the field trip. Spittal Pond is an important bird sanctuary, especially to migrating birds, as it provides them with food, water and shelter. The pond is a harsh environment to which a few organisms have adapted, including the American eel.